GRAPEVINE, Texas (AP) — After lengthy and wrenching debate, local leaders of the Boy Scouts of America have voted to open their ranks to openly gay boys for the first time, but heated reactions from the left and right made clear that the BSA's controversies are far from over. 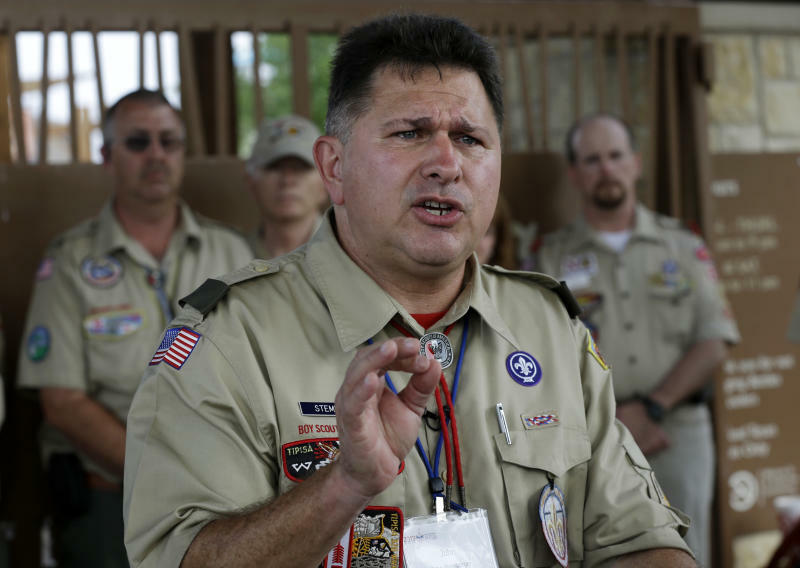 The Scouts' longstanding ban on gay adults remains in force, and many liberal Scout leaders — as well as gay-rights groups — plan to continue pressing for an end to that exclusion even though the BSA's top officials aren't ready for that step. The vote was conducted by secret ballot Thursday during the National Council's annual meeting at a conference center not far from Boy Scout headquarters in suburban Dallas. Of the roughly 1,400 voting members of the council who cast ballots, 61 percent supported the proposal drafted by the governing Executive Committee. The policy change takes effect Jan. 1. "This has been a challenging chapter in our history," the BSA chief executive, Wayne Brock, said after the vote. "While people have differing opinions on this policy, kids are better off when they're in Scouting." "We are deeply saddened," said Frank Page, president of the Southern Baptist Convention's executive committee. "Homosexual behavior is incompatible with the principles enshrined in the Scout oath and Scout law." The Assemblies of God said the policy change "will lead to a mass exodus from the Boy Scout program." It also warned that the change would make the BSA vulnerable to lawsuits seeking to end the ban on gay adults. John Stembeger, a conservative activist and former Scout from Florida, founded a group called OnMyHonor.net to oppose the policy change. He assailed the BSA executive committee for its role in gaining a "yes" vote. "What kind of a message are we sending to young people about being brave when its top adult leaders don't even have the courage to stand up to the pressure of a militant lobby when the bullies in Washington, D.C., Hollywood or even some of their own renegade councils start pressuring and harassing them?" he asked. He said OnMyHonor.Net and other like-minded organizations and individuals would meet in Louisville, Ky., next month to discuss the creation of "a new character development organization for boys." "While I will always cherish my time as a Scout and the life lessons I learned, I am greatly disappointed with this decision," he said. White House spokesman Shin Inouye said President Barack Obama welcomed the Scouts' decision regarding gay youth but "continues to believe that leadership positions in the Scouts should be open to all, regardless of sexual orientation." The result also was welcomed by many liberal members of the Scouting community and by gay-rights activists, though most of the praise was coupled with calls for ending the ban on gay adults. "I'm so proud of how far we've come, but until there's a place for everyone in Scouting, my work will continue," said Jennifer Tyrrell, whose ouster as a Cub Scout den leader in Ohio because she is lesbian launched a national protest movement. "He doesn't deserve to be told that we're not good enough," she said. "We're not going to stop until this is over." "I was thinking that today could be my last day as a Boy Scout," he said. "Obviously, for gay Scouts like me, this vote is life-changing." Tessier is on track to receive his Eagle Scout award — he only needs to complete his final project — but said he is troubled that on his 18th birthday he could transform from someone holding Scouting's highest rank to someone unfit to be a part of the organization. "That one couple hours (between 17 and 18) will make me not a good person," he said. James Dale, 42, who was the first person to challenge the Boy Scouts gay ban in court, agreed, called the decision "a bit of a step backward" for gay youth. "It sends a very convoluted, mixed message to gay kids. It says that being gay is a youthful indiscretion, and that there's no future for you," Dale, of New Jersey, told The Star-Ledger. Tessier has indeed been an exception — an openly gay Scout whose presence was quietly accepted by local Scout leaders. In general, the Scouts' policy has been to avoid any questioning of would-be Scouts as to their sexual orientation, but to dismiss boys who did speak openly about being gay. The proposal approved Thursday was seen as a compromise, and the Scouts stressed that they would not condone sexual conduct by any Scout — gay or straight. "The Boy Scouts of America will not sacrifice its mission, or the youth served by the movement, by allowing the organization to be consumed by a single, divisive and unresolved societal issue," the BSA said in a statement. The BSA's overall "traditional youth membership" — Cub Scouts, Boy Scouts and Venturers — is now about 2.6 million, compared with more than 4 million in peak years of the past. It also has about 1 million adult leaders and volunteers. Those include liberal churches opposed to any ban on gays, but some of the largest sponsors are relatively conservative denominations that have previously supported the broad ban — notably the Roman Catholic Church, the Church of Jesus Christ of Latter-day Saints and Southern Baptist churches. The Utah-based Mormon church — which has more Scouting troops than any other religious denomination — reacted positively. "We trust that BSA will implement and administer the approved policy in an appropriate and effective manner," an LDS statement said. Utah's largest Boy Scout councils supported the change. "This is a win for youth and a win for the community," said John Gailey, spokesman for the Utah National Parks Council, which covers central and southern Utah. "It gives all youth the opportunity to take advantage of the values instilled by Scouting." The National Catholic Committee on Scouting responded cautiously, saying it would assess the possible effect of the change on Catholic-sponsored Scout units.